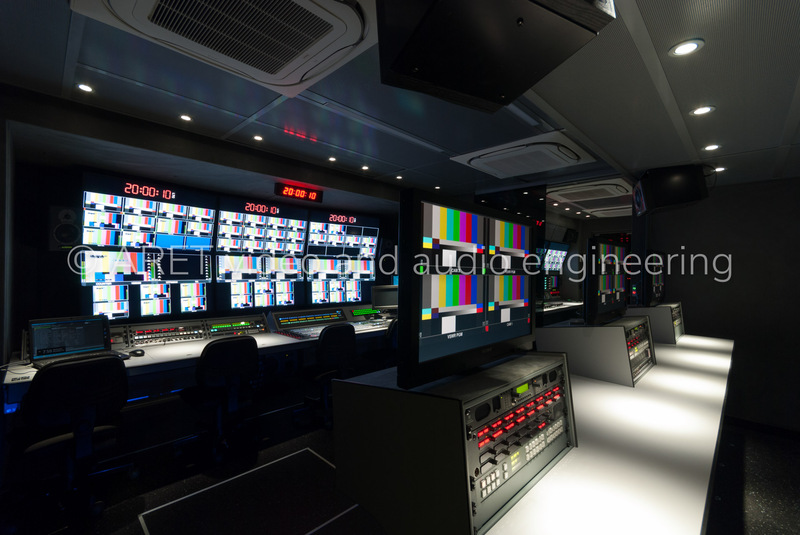 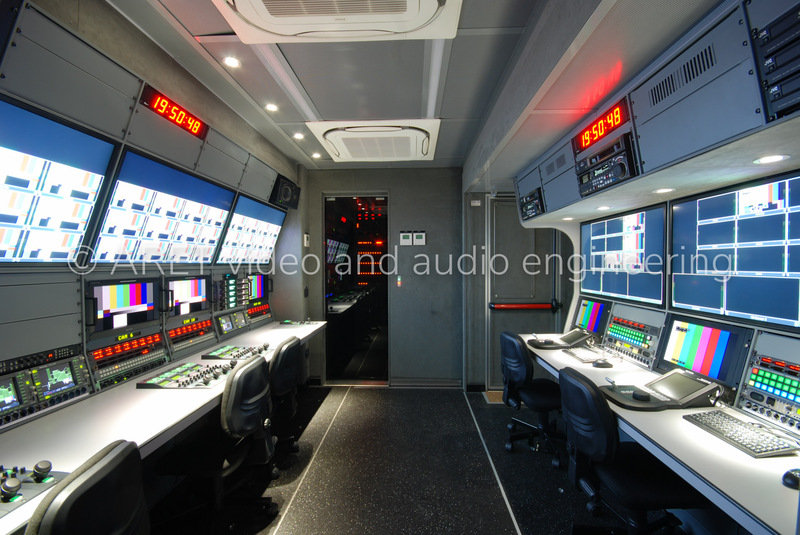 This Double Expandable HD OB Van Trailer has been designed for 16-20 HD Cameras (with wireless and latest Hyper Slomotion Cameras) and it has been thought to represent the state of the art in huge production trailers. 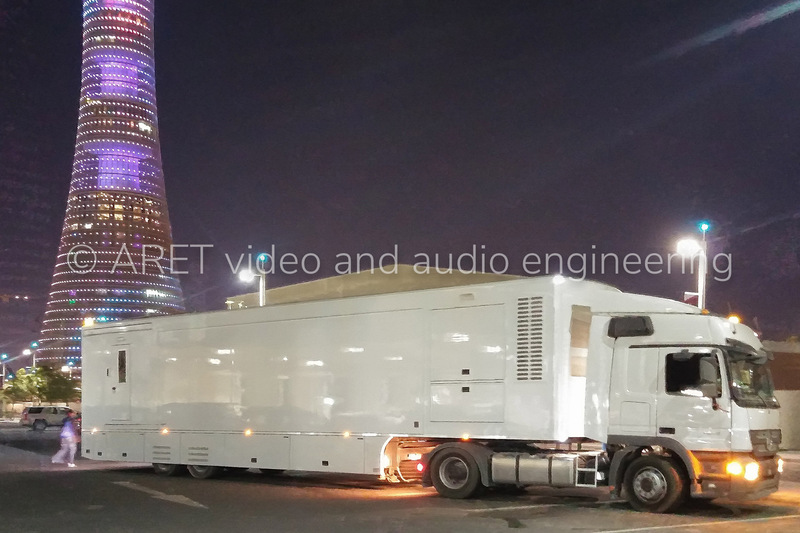 This Trailer has been manufactured to operate in a country with hard weather conditions. 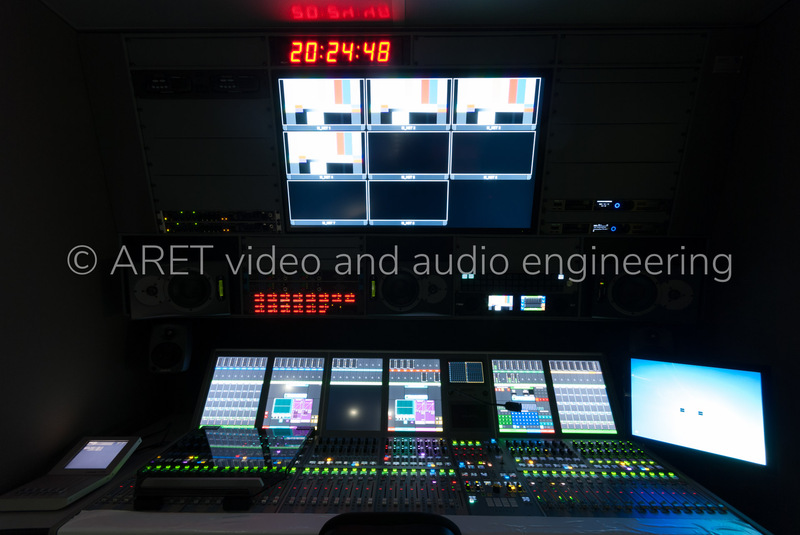 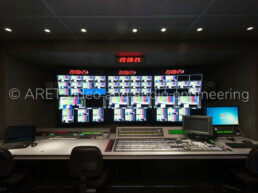 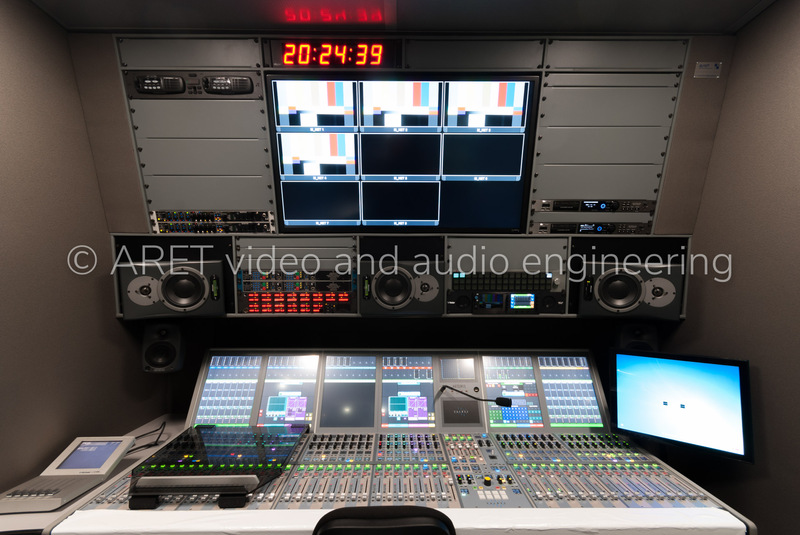 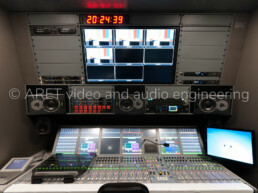 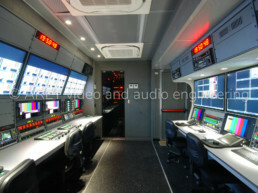 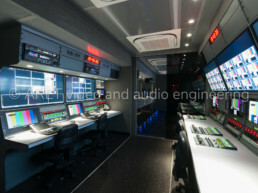 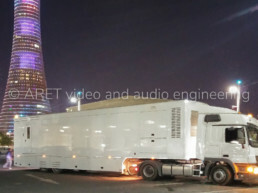 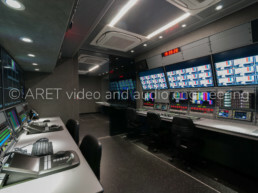 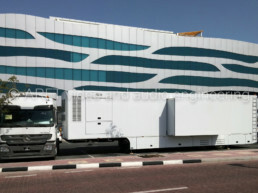 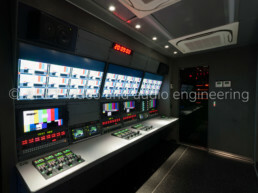 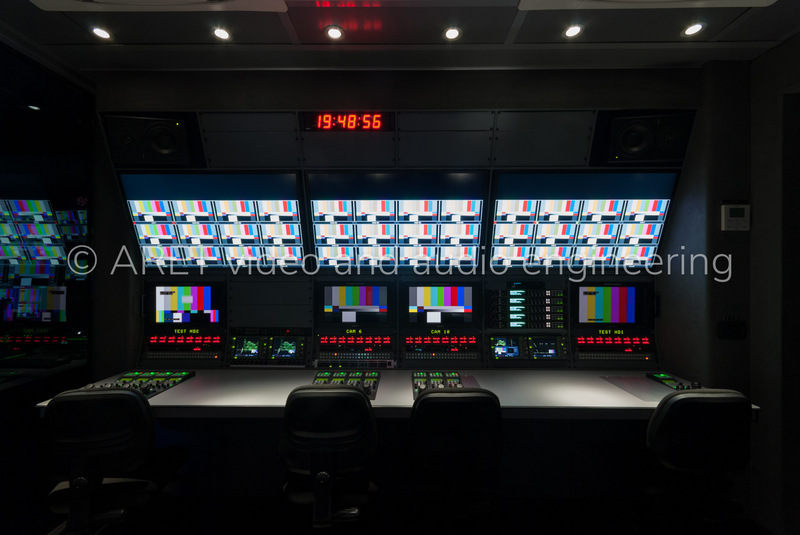 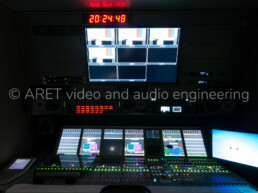 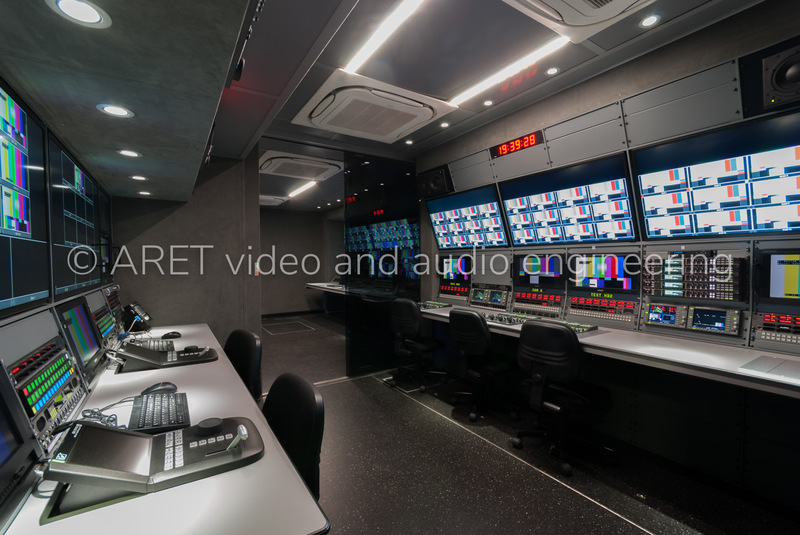 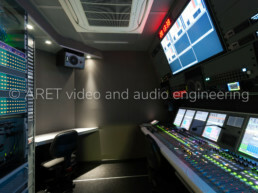 Therefore the coachbuilding has been carried out looking at ARET’s more than 40 years experience in Outside Broadcast Van, with more than 240.000 Btu of cooling power and by means of special patented construction techniques. 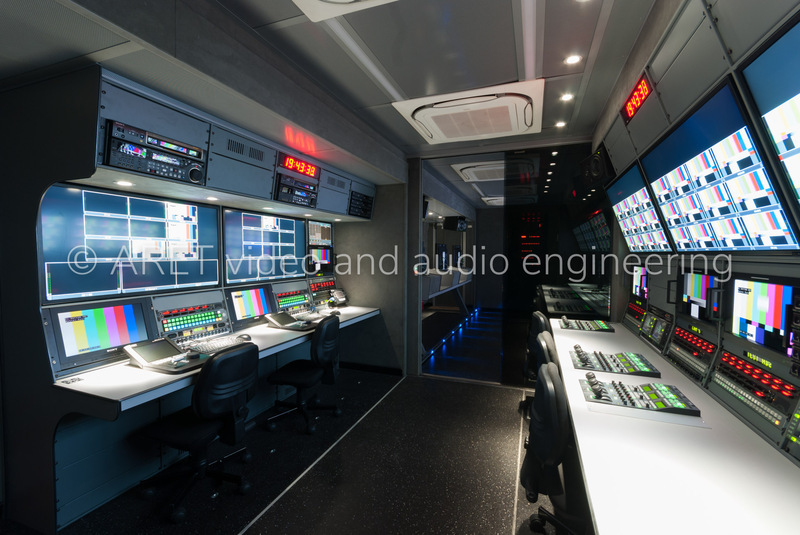 The double expansion side maximizes the internal volume (essential for the most important Productions) and provides a huge 3D shaped monitor wall. 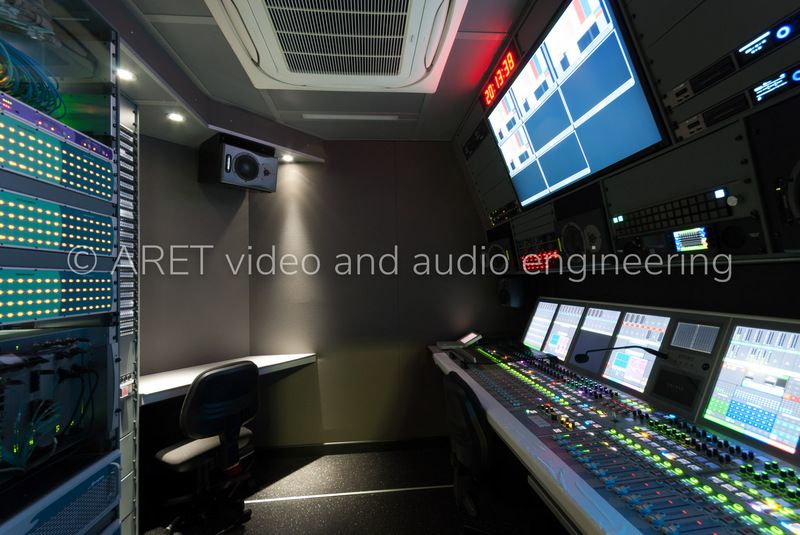 Every detail, such as the dedicated acoustic treatment of the Sound Room, has been customized and designed based on customer’s requirements, as per ARET tradition. 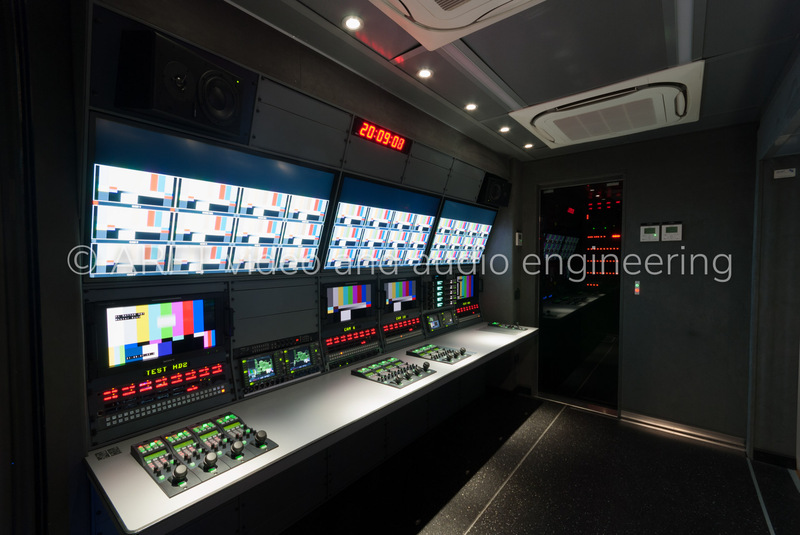 The project has been focused also to give the easiest operation and maintenance, with reliability and duration. 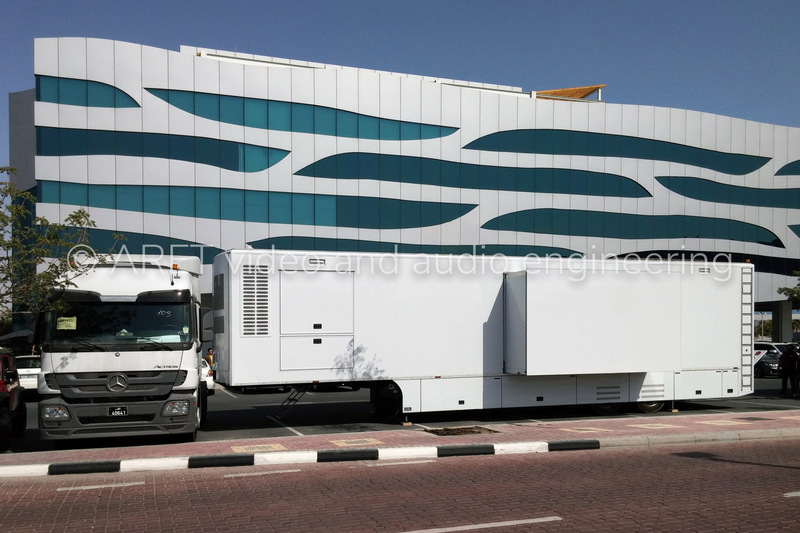 This Trailer has been delivered with latest UPS solutions and with a dedicated Support Truck mounting a 75kVA diesel generator. 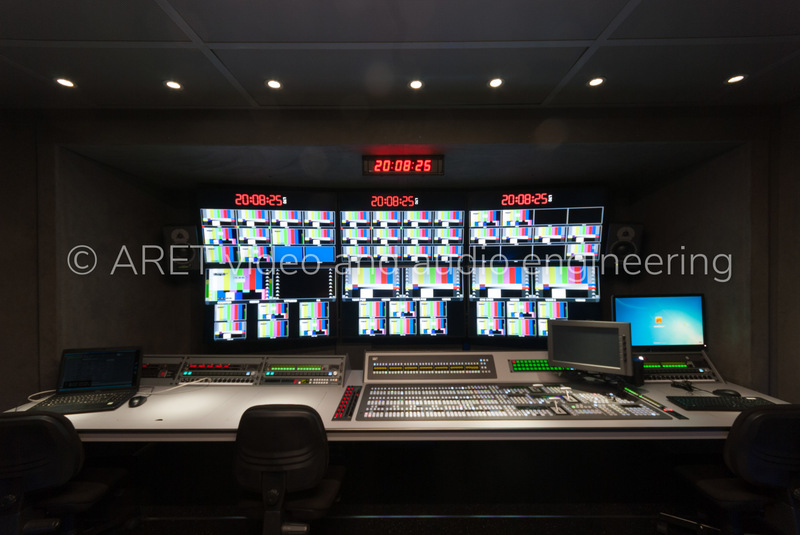 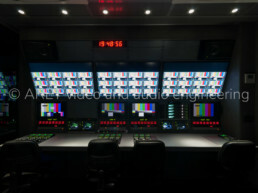 The internal space is divided into four main operational areas: Production room, Camera control, VTR and Slomo Area, and Sound Room. 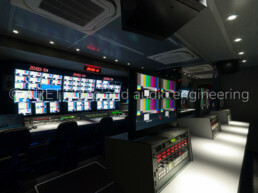 Equipment is installed in a dedicated room.